Takes a YouTube username (and a couple other variables) and returns a whole video website with paginated lists, thumbnails, embeds, comments, and an RSS feed. Basically, it’s your YouTube profile with its own domain and CSS. Requires PHP5 (or maybe just SimpleXML installed with the simplexml_load_file() function) and a YouTube username. Doesn’t need a database or a YouTube API key. * This is the site I originally wrote this script for. It hasn’t been updated in awhile, but if/when I ever get it more fleshed out, I’ll write another blog post for it. Help Me Test It, Pretty Please? Do you have PHP hosting somewhere and a YouTube account? I could really use some other eyes and brains looking at this. Let me know if you need any help getting it set up. 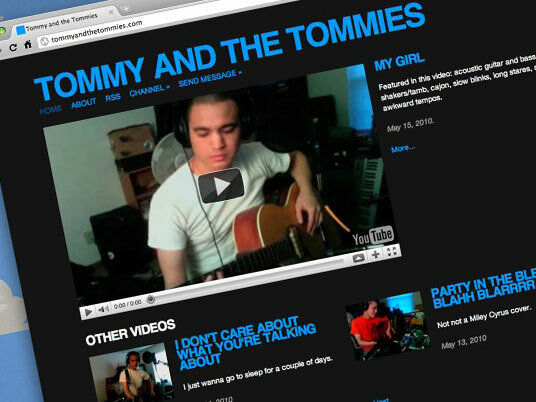 Posted on April 8, 2011 in Web and tagged espresso, github, jquery, php, portfolio, tommy and the tommies, youtube. Tommy, This is Tuyen. I check this site once in a blue moon. I didn’t know you are in Dallas. I was there back in March. How/What are you doing these days? I just did a very similar project but with Vimeo as a base. :) Fancy combining the two? @arby You’re more than welcome to!